It is easy to have faith when we know where we are going... but as we all know, that's not always how it actually goes. Oftentimes life goes down unexpected paths and we feel as though we are trying to make our way through it blindfolded. This very popular verse reminds us that we do not have to see what's coming...we just have to keep the faith. 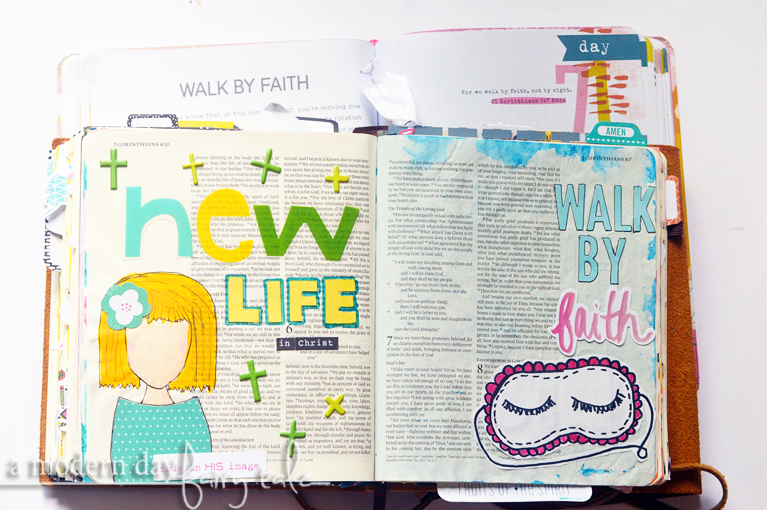 For this page, I was inspired by my new Illustrated Faith planner. One of the first pages I'd opened it up to was the September divider which featured this verse and an adorable little sleep mask. I immediately fell in love and knew that I wanted to journal that at some point! 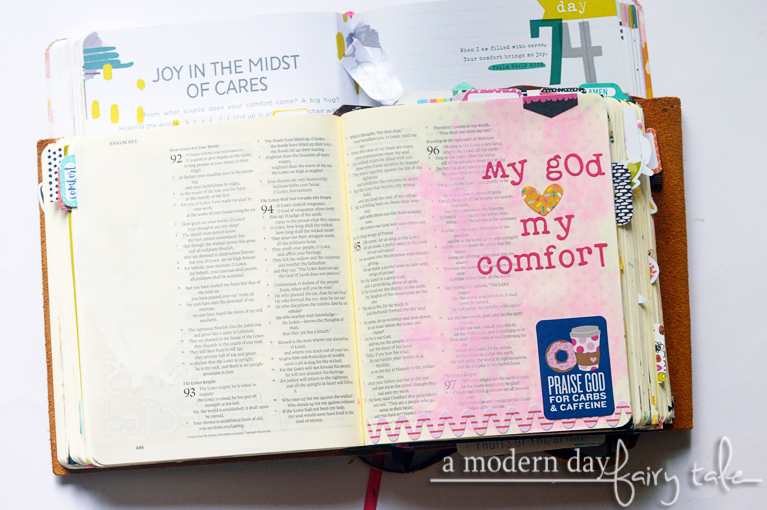 Imagine my delight when I opened my journal to discover this verse! God's timing has certainly been showing through throughout this challenge! In the end, this turned out to be my favorite page from this week. What a great reminder this is, right? Sometimes we can feel very much alone in whatever we are struggling with. Maybe we are actually physically far from those we love, or maybe we just feel distant in that no one else quite understands the struggles we go through. We feel as though we have no one to turn to. These verses remind us that God is right there. He is always close, always there. For this page, I kept it pretty simple... because sometimes simple is better! 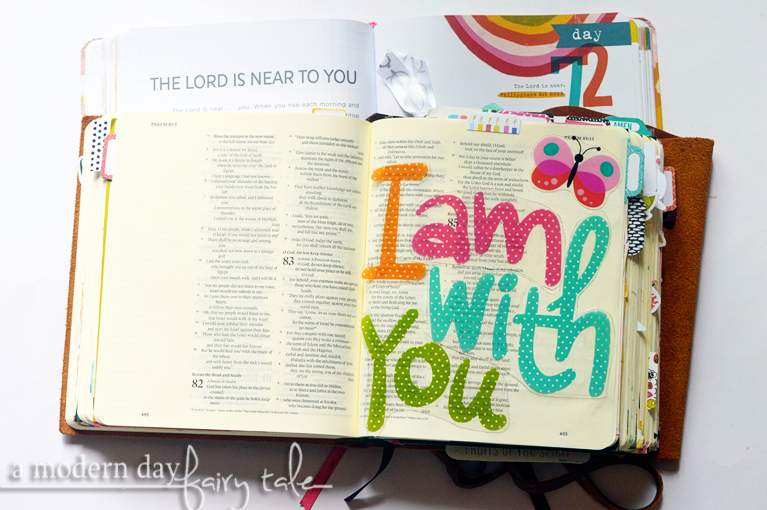 I'd had these die cuts simply expressing 'I am with you' and I thought it was the perfect way to illustrate that no matter where we go, God is always right beside us. For those of us who live in an area where storms are common, the image of a safe shelter is pretty familiar. To be honest, I have a severe phobia of storms, so for me... even more so. I know the comfort of being in a place where I feel safer. Needless to say these verses resonate well with me. 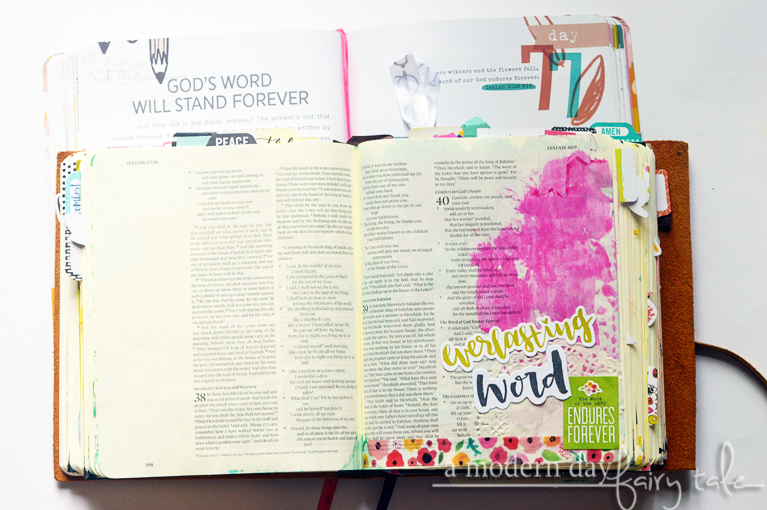 For this page, I realized I had already completed the page I preferred on a previous day, BUT I decided rather than choose a different verse as I sometimes do, I was going to expand upon that message on the opposite page. 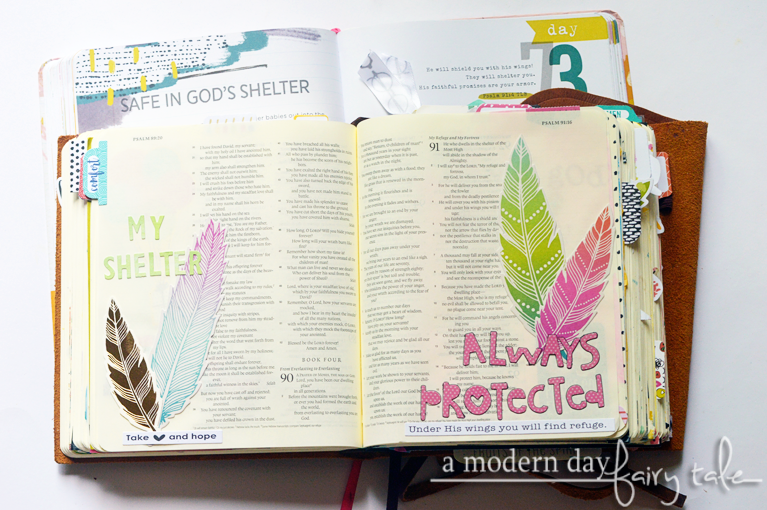 I kept with the feather theme with different feathers and more attention to the idea of 'shelter'. "When I am filled with cares, you comfort brings me joy!" I love this verse. It reminds me very much of the relationship that I have with my own children. They always know that when they are scared or hurting, they can come to me for snuggles. They find comfort in that and it helps them to overcome and find their smiles again. Likewise, I want to be like a child coming to the heavenly Father with all of my cares, knowing that He will make it all better. For this page, I really wanted to focus on the idea of comfort. I've mentioned before that one of my goals in this challenge was to try new techniques and styles, but another goal was to use up some of the supplies I'd had and wasn't sure how to put to use. This 'Praise God for Carbs & Caffeine' was one of them. I loved that fun message.. I live that message... I just couldn't figure out exactly how or why to use it. As I was thinking about this page on comfort, that sticker came to mind. Because coffee and donuts...? Sure sounds like comfort to me! And hey, there is some comfort in laughter too, don't you think? When reading through these verses, two things came to mind. First was the image of a bird being freed from it's cage. The second was the song 'Amazing Grace (My Chains Are Gone)'. Well, I didn't have any images of birdcages or flying birds (and wasn't confident in my ability to draw them) so that was out. And I'd previously journaled a broken chain with lyrics from the song 'Break Every Chain', so I wasn't sure I wanted to repeat that. Instead, I combined them a bit... a bird singing and the simple message 'set free'. In my mind, the bird was singing this song..whether that's reflected to anyone else, doesn't matter to me! 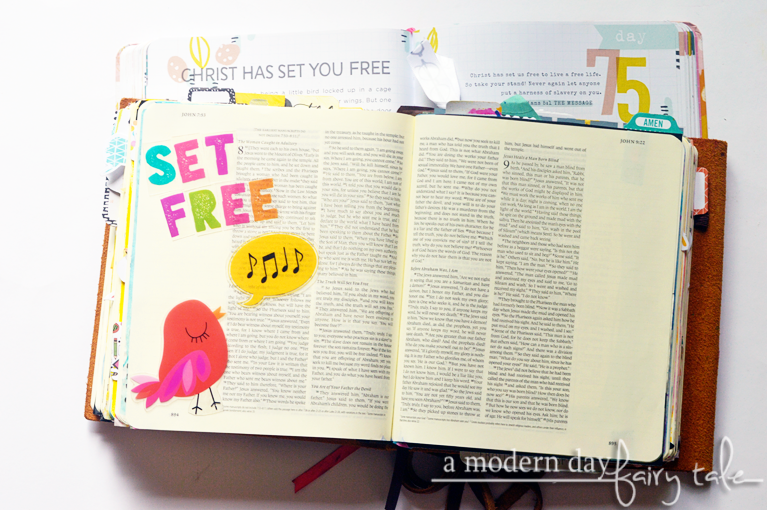 I loved the brightness and simplicity of this entire page! Aside from John 3:16, the verses on love in 1 Corinthians 13 are probably the most well known verses out there... so reading the title of day 76, many of us are probably brought back right to there. And these three remain. 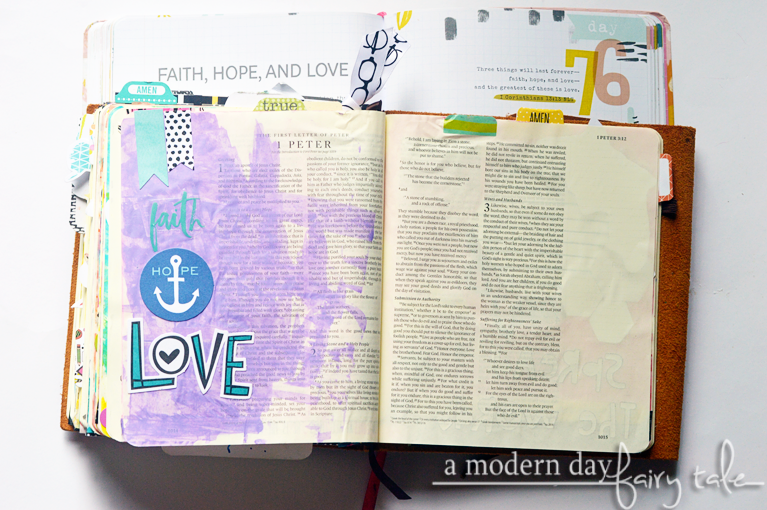 For this page, I decided to again simply focus on the words: Faith. Hope. Love. While that verse in 1 Corinthians is perhaps the most popular, these are three topics talked very often throughout the Bible. We have to have faith in God always. We have to keep the hope that God will work everything for the good. And most importantly, we have to love always. Have you ever read a book from many years ago and found yourself thinking...this would never happen today! Maybe the actual events seem so far off in history to hold much relevance, or maybe the language used is not what we would use today. I think about the controversy of some classic pieces of literature now under scrutiny because while the norm in the time of writing, show attitudes and language that is no longer acceptable. But the Bible has remained longer than any other book, and remains a top seller. Yes, there have been different translations and different styles... but the Word remains. The messages are the same, now and forever. It does not change with the time to fit the needs of our current society (though many might try), but stands firm with messages still relevant even now. What other book can truly say that?